It looks absolutely delicious! I've really been enjoying cooking lately - and since I just got a new slow cooker I've been digging through the internet (mainly pinterest) for recipes to use with it. This isn't one of them but those will be next. As of recently I've really been looking into different recipes for chicken that I can bake vs. fry or stir fry. The boys and I have been eating so much of the same thing that I want to change things up a bit. Baked chicken isn't much of a change - but the flavors and the recipe are something different that definitely need to be tried. 2. 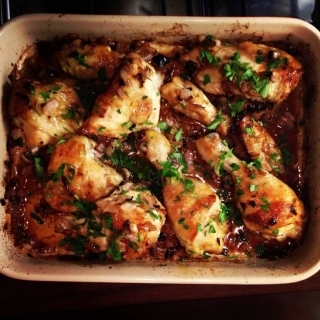 In a large baking dish - combine marinade and toss with chicken. Season it well. 3. Place chicken pieces skin side up and roast for 30 minutes until it begins to brown. Then remove and baste with marinade. Flip pieces and bake a remaining 10mins or until chicken is cooked. 4. Garnish with lots of fresh parsley. Picture updates when this is baked!